Mainroad Contracting staff put barriers on the site of the Walker's Hook Road washout shortly after it occurred in January. Single-lane access has been restricted to residents since then. With repairs on Walker’s Hook Road scheduled to begin in the next two weeks, residents along the road would like to see further consultation between themselves and the Ministry of Transportation and Infrastructure to ensure the needs of the road are met. 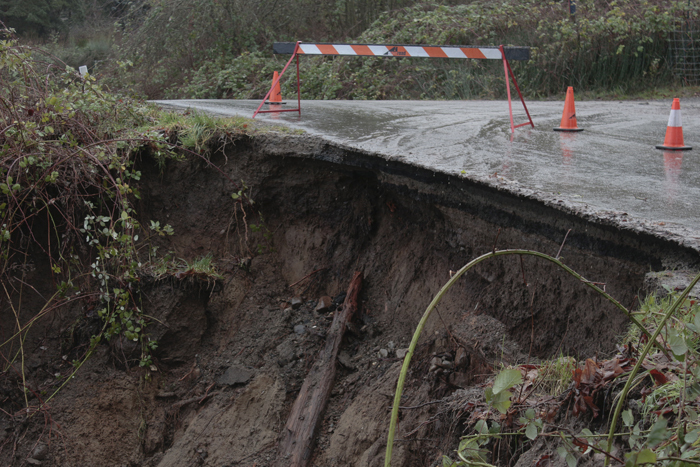 The road, which was washed out at the end of January, was closed to traffic due to the unstable nature of the embankment. Nearly 100 mm of rainfall coming down over one weekend eroded the hillside, causing it to fall away from the road surface. The repair work will focus on rebuilding the damaged road, improving drainage and reinforcing slide areas from further erosion, according to the ministry. It is hoped that the work will be completed by early fall. Walker’s Hook Road has washed out in the past, most recently in September 2016. The ministry-approved budget for the remedial repairs was $100,000. MOTI is not able to offer a final cost for the upcoming project. Staff are hoping to finalize the budget in August. Deborah McGovern, who has lived on Walker’s Hook for 16 years, would like MOTI personnel to speak with people who are affected by the closure on the road before the repair work begins. The road is currently blocked off from the south side and reduced to single-lane traffic from the north for local access only. McGovern is concerned about the hazards caused by the road blocks. The barriers are made of concrete and stretch across the road, though McGovern said that unless drivers were already aware of the barriers there is a risk of either colliding with the barriers or going over the bank. Since the closure, Walker’s Hook has been safer for pedestrians and children to play on, but it has left those living between the barriers relatively stranded. If other options were available, McGovern would be amenable to keeping it closed, but the road is the only way in or out of the properties in the area. MOTI plans to start work on the road in the next two weeks when the clay and subsoil is sufficiently dried. Throughout the closure, the ministry has been doing geotechnical work. According to an email, personnel hope that the work will help prevent future washouts.